General Dynamics Corporation (GD) provides business aviation, combat vehicles, weapons systems and munitions, military and commercial shipbuilding, and communications and information technology products and services worldwide. 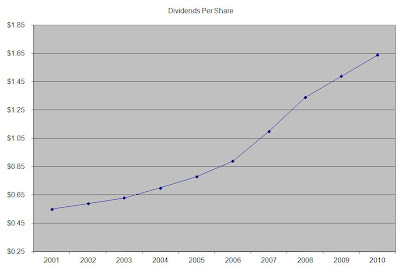 This dividend achiever has paid uninterrupted dividends on its common stock since 1979 and increased payments to common shareholders every year for 20 consecutive years. Most recently, Warren Buffett's Berkshire Hathaway initiated a stake in General Dynamics. The most recent dividend increase was in March 2011, when the Board of Directors approved a 11.90 % increase in the quarterly dividend to 47 cents/share. General Dynamics’s largest competitors include Boeing (BA), Lockheed Martin (LMT) and Textron (TXT). Over the past decade this dividend growth stock has delivered an annualized total return of 4.40% to its shareholders. The company has managed to deliver a 12.70% annual increase in EPS since 2001. Analysts expect General Dynamics to earn $7.22 per share in 2011 and $7.59 per share in 2012. In comparison General Dynamics earned $6.82 /share in 2010. The company has been able to buyback 0.60% of its shares outstanding every year on average over the past decade. General Dynamic’s largest customer is the US Government, which accounts for 40% of global military spending. Given the challenging political climate, there is a high level of uncertainty behind future increases in defense spending coming out of the US. This being said, the company does have other customers in other markets and also other divisions such as the Aerospace one that is producing Gulfstream Jets. Demand in the Aerospace division will be fueled by new product introductions and demand from emerging markets. The major obstacles behind General Dynamics include inability to win any major defense contracts, major cuts in military budgets as well as a slowdown in commercial aviation. 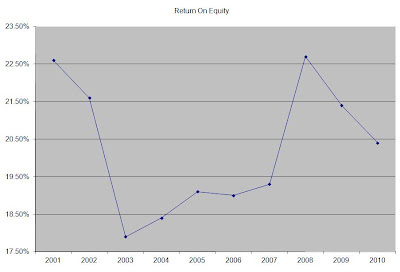 The company’s Return on Equty has remained in a tight range between 17.50% and 22.50% over the past decade. Rather than focus on absolute values for this indicator, I generally want to see at least a stable return on equity over time. 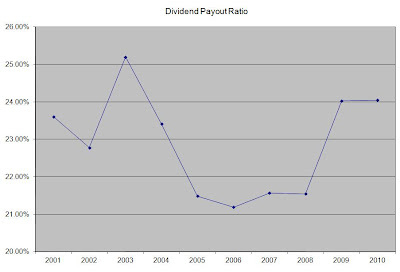 The annual dividend payment has increased by 12.90% per year since 2001, which is in line with the growth in EPS. A 13% growth in distributions translates into the dividend payment doubling almost every fie and a half years. If we look at historical data, going as far back as 1974 we see that General Dynamics has actually managed to double its dividend almost every six years on average. The dividend payout ratio has remained in arrange between 21% and 25%. A lower payout is always a plus, since it leaves room for consistent dividend growth minimizing the impact of short-term fluctuations in earnings. Currently General Dynamics is attractively valued at 9.50 times earnings, has a sustainable dividend payout and yields 2.80%. - Should you follow Buffett’s latest investments? - Lockheed Martin Corporation (LMT) Dividend Stock Analysis.